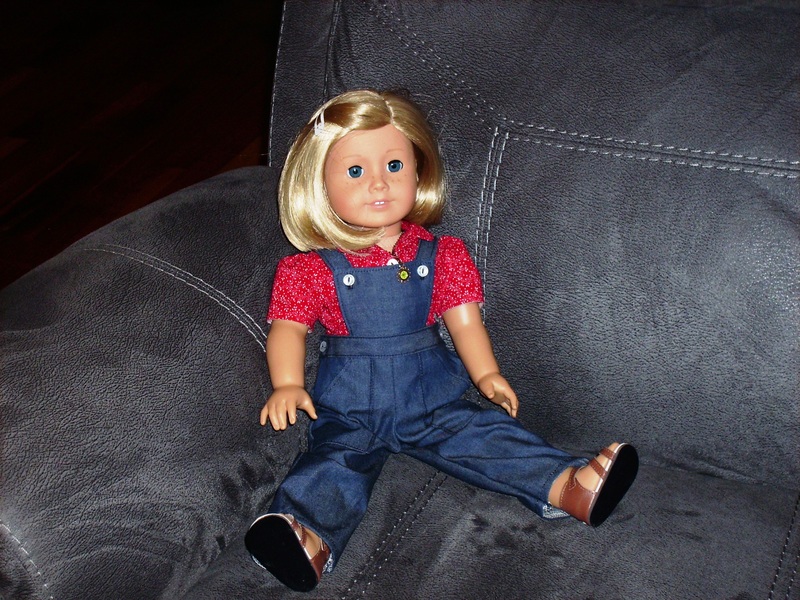 So it has been a couple of months since my dolls had a new outfit. This time, Kit decided it was her turn for a new outfit. 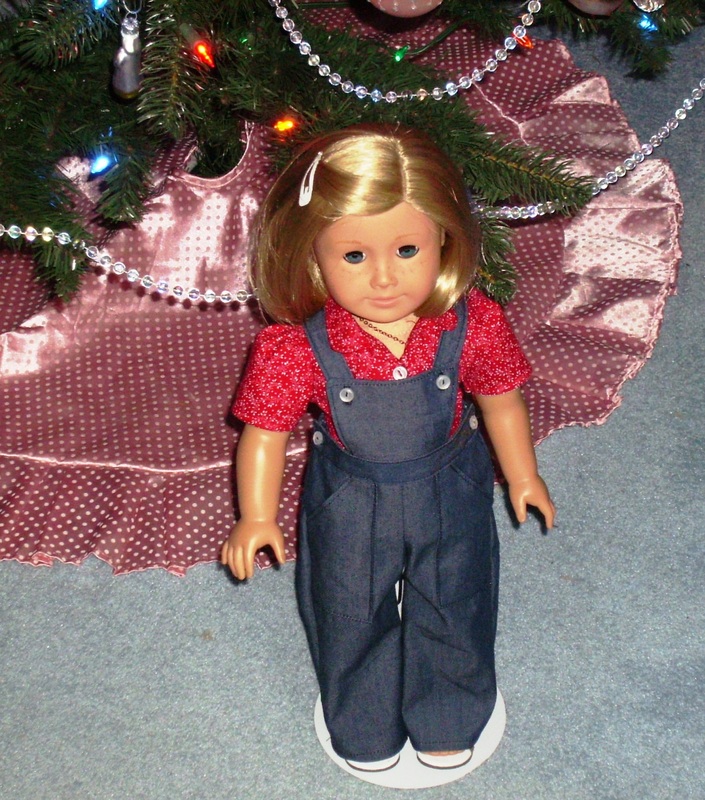 I had previously purchased the “Bibbed Playsuit” from Keeper Dolly Duds’ Etsy store and was inspired to use it from looking at American Girl Wiki’s Kit Hobo outfit. It was a top and overalls. Granted I really follow the inspiration piece exactly because I didn’t want to put holes in the new overalls. For a while, I have been working on making a couple of dresses for my mom for Christmas (better early than too late). So in between dresses, I made Kit’s red blouse. I think the fabric came from a Lee & Pearl fabric mystery bundle and it looks to be cotton. 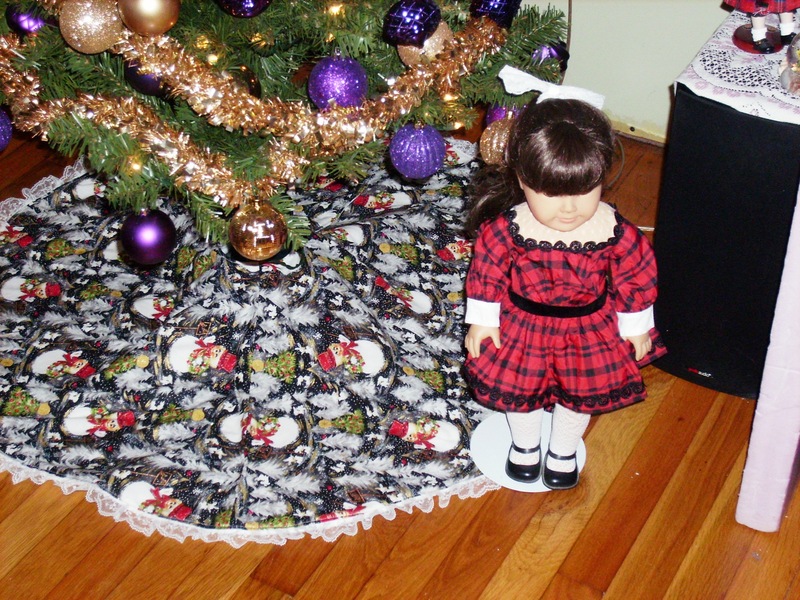 This blouse was fairly easy to make and I only looked at the instructions for the collar and facing. If you have made Simplicity 1086 (the 1950’s pattern for Mary Ellen from Keeper Dolly Duds), this blouse is pretty much similar. I think the big difference is the collar shape and this one has sleeves. 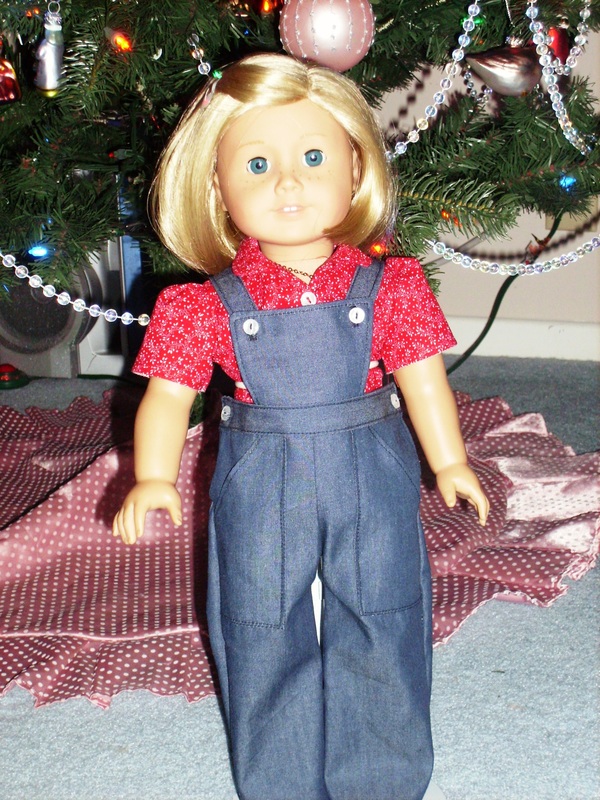 The overalls are rated as intermediate pattern. To be complete honest, my laptop computer died right before I was going to make this. I did look at the pattern pieces to see if I could figure out how they went together without instructions. I couldn’t do it and at least found a computer where I could print out the instructions. 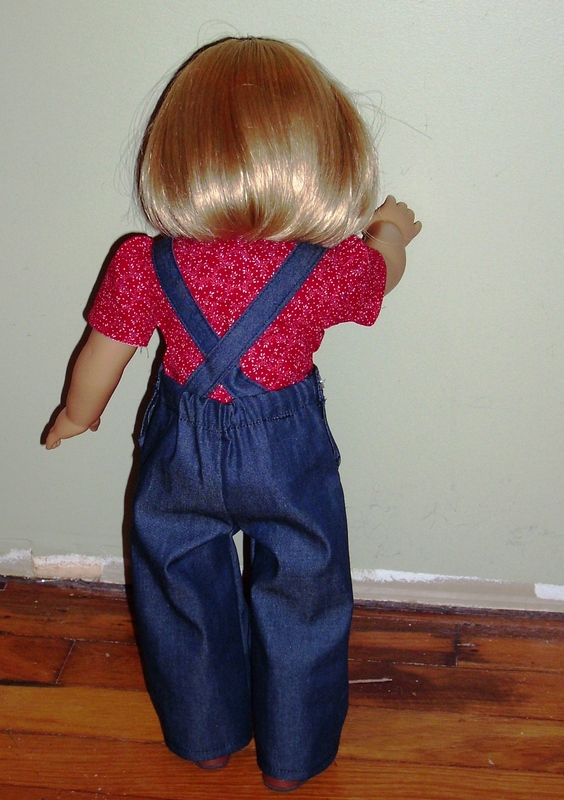 As long as I followed the instructions, the overalls were fairly easy to put together. So the intermediate classification is fairly accurate. This definitely isn’t a beginner’s project with buttonholes, plackets and topstitching. For the overalls, I used a chambray remnant from Hancock Fabrics. I decided on the pants length with the trim pockets. It took a while to find the trim box in my craft room reorganization, but unfortunately it didn’t yield anything useful. The rick-rack I found at an antique mall was too off white to go with the white buttons I had picked out for the overalls before. So the trim was eliminated as I was trying to use stash for this project. The front waistband required some thought as to how the pieces went together. The other part that required some thought was inserting the elastic. In the end, I decided that the elastic was not to go to the edge of the back pant pattern piece as that folds over for a facing for the buttons. My parents got a new slim tall Christmas tree this year. 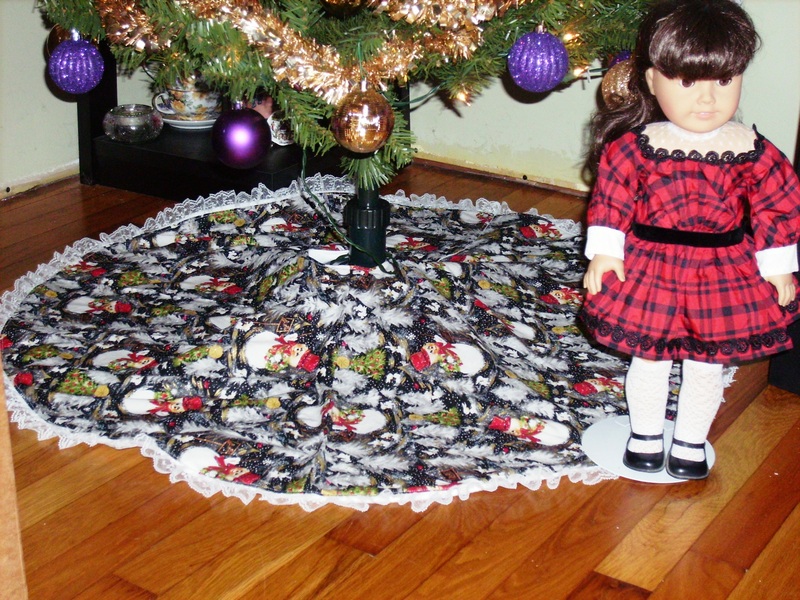 The old tree skirt was just too big (even after taking and trimming it with scissors). 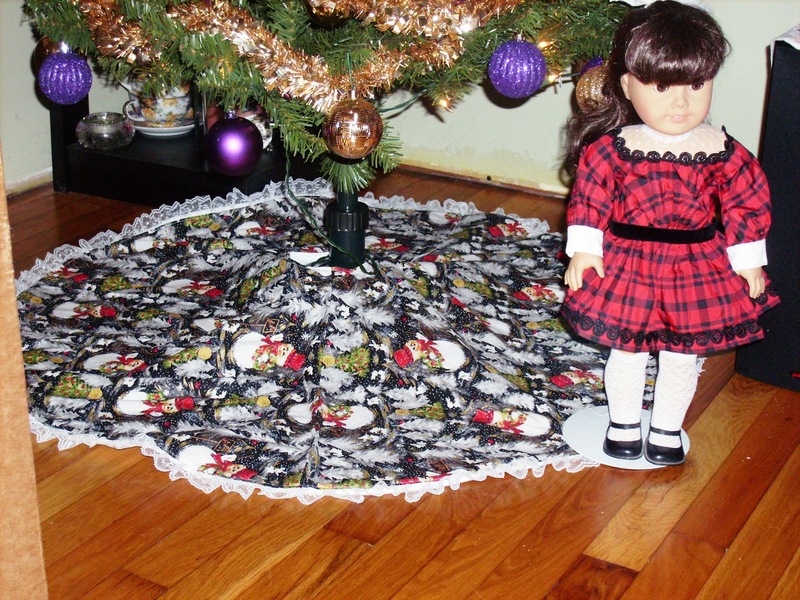 No stores really seem to sell small (like 36 inches or 30 inch diameter) skirts. 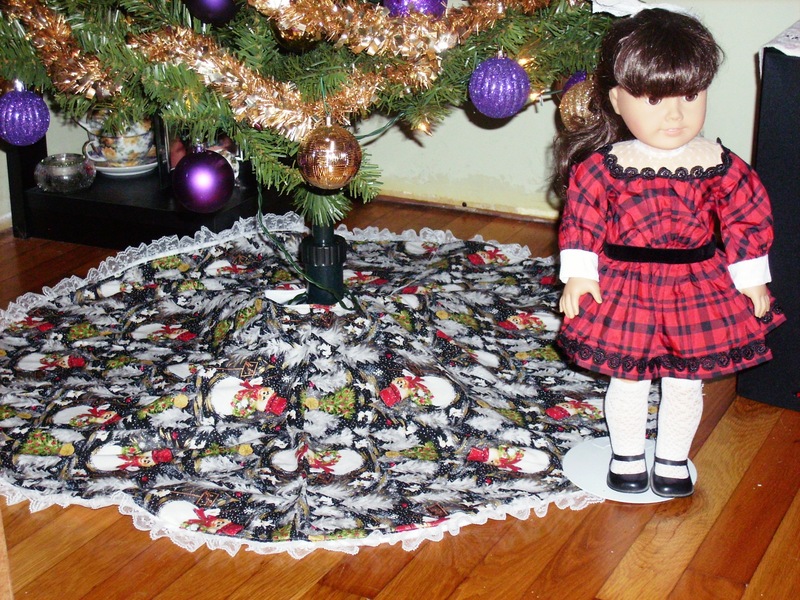 So the Christmas tree got a simple full circle skirt with lace and fleece backing. First up was estimating how much fabric to buy. Guessing, 15 inch waist for the tree (because I didn’t have the ability to measure it) and back calculating to check to see if it is a reasonable pole diameter. Remember that the circumference of the circle is Pi multiplied by diameter. Estimated pole was 4.5 inches. Outer radius for bottom of skirt was estimated at 20.25 inches (for around 36 inch skirt diameter). So I could squeak by with 1.25 yards of fabric (that is with 5 inches of extra space. I told my mom 1.5 yards just to be on the safe side. After we picked up the fabric, I measured the tree. Its waist line is more like 7 or 8 inches instead of 15. Also, my parents decided on 30 inches diameter instead of 36 inches. All the math had to be recalculated. Since I didn’t pull back up the circle skirt calculators from the internet, I had to make sure I added at least 1 seam allowance for the waist. It is a case were smaller diameter will be fine. Half circles were cut. Lace was applied to the outer layer. Then fleece and outer layer were stitched together with an opening for turning it right side out. Everything then was top-stitched closed.